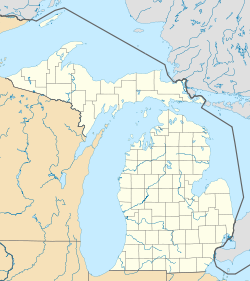 Bad Axe is a city in the U.S. state of Michigan and the county seat of Huron County in the Thumb region of the Lower Peninsula. The population was 3,129 at the 2010 census. The population was 3,462 at the 2000 census, making it the largest community in Huron County and second largest in the Thumb, after Caro (if Lapeer and St. Clair counties, part of Metro Detroit, are not included). The city was established in 1905. The city's unusual name dates to the time of its settlement. While surveying the first state road through the Huron County wilderness in 1861, Rudolph Papst and George Willis Pack made camp at the future site of the city and found a much-used and badly damaged axe. At Pack's suggestion, Papst used the name “Bad Axe Camp” in the minutes of the survey and on a sign he placed along the main trail. The first post office in Bad Axe was established in 1870. According to the United States Census Bureau, the city has an area of 2.26 square miles (5.85 km2), all land. This climatic region has large seasonal temperature differences, with warm to hot (and often humid) summers and cold (sometimes severely cold) winters. According to the Köppen Climate Classification system, Bad Axe has a humid continental climate, abbreviated "Dfb" on climate maps. As of the census of 2010, there were 3,129 people, 1,358 households, and 760 families residing in the city. The population density was 1,384.5 inhabitants per square mile (534.6/km2). There were 1,546 housing units at an average density of 684.1 per square mile (264.1/km2). The city's racial makeup was 95.1% White, 0.8% African American, 0.9% Native American, 1.5% Asian, 0.4% from other races, and 1.2% from two or more races. Hispanic or Latino of any race were 2.4% of the population. There were 1,358 households, of which 27.5% had children under the age of 18 living with them, 36.8% were married couples living together, 14.7% had a female householder with no husband present, 4.4% had a male householder with no wife present, and 44.0% were non-families. 38.7% of all households were made up of individuals and 17% had someone living alone who was 65 years of age or older. The average household size was 2.16 and the average family size was 2.81. The median age in the city was 42.9 years. 21.3% of residents were under the age of 18; 8.3% were between the ages of 18 and 24; 23.2% were from 25 to 44; 26.6% were from 45 to 64; and 20.5% were 65 years of age or older. The city's gender makeup was 46.5% male and 53.5% female. As of the census of 2000, there were 3,462 people, 1,418 households, and 877 families residing in the city. The population density was 1,617.3 per square mile (624.6/km²). There were 1,545 housing units at an average density of 721.8 per square mile (278.8/km²). The city's racial makeup was 97.57% White, 0.26% African American, 0.26% Native American, 0.58% Asian, 0.38% from other races, and 0.95% from two or more races. Hispanic or Latino of any race were 1.53% of the population. There were 1,418 households, of which 31.7% had children under the age of 18 living with them, 45.3% were married couples living together, 12.9% had a female householder with no husband present, and 38.1% were non-families. 33.5% of all households were made up of individuals and 15.1% had someone living alone who was 65 years of age or older. The average household size was 2.31 and the average family size was 2.95. In the city, the population was spread out with 24.2% under the age of 18, 8.5% from 18 to 24, 27.5% from 25 to 44, 21.6% from 45 to 64, and 18.3% who were 65 years of age or older. The median age was 39 years. For every 100 females, there were 87.5 males. For every 100 females age 18 and over, there were 85.1 males. The city's median household income was $32,125, and the median family income was $42,650. Males had a median income of $34,758 versus $20,288 for females. The city's per capita income was $17,465. About 9.3% of families and 14.1% of the population were below the poverty line, including 16.1% of those under age 18 and 14.3% of those age 65 or over. The district's George E. Greene Elementary School was shut down in 2011; Ascent High School, an alternative high school, occupies its former building.. The Bad Axe Elementary School is now in the building that housed the district's Intermediate School. Local radio stations licensed to serve Bad Axe are commercial broadcasters WLEW-AM and WLEW-FM. Bad Axe and the northern thumb area are served by a daily newspaper, the Huron Daily Tribune and the Huron County View. Daily editions of the Detroit Free Press and The Detroit News, as well as thrice-weekly editions of the Bay City Times and Saginaw News, are also available. Huron County lies inside the Flint/Tri-Cities Television Market. Only stations available on Comcast in the Bad Axe area are listed below. WDCQ is the Thumb's only television station, licensed to Bad Axe, and owned and operated by Delta College, near Bay City. The station's studios are located at Delta College, with its digital transmitter in Quanicassee, in northwestern Tuscola County. The station's analog transmitter was based near Bad Axe, but went dark in June 2009. ^ "City of Bad Axe, Michigan". City of Bad Axe, Michigan. Retrieved August 25, 2012. ^ Don Voorhees (4 October 2011). The Super Book of Useless Information: The Most Powerfully Unnecessary Things You Never Need to Know. Penguin Group US. p. 67. ISBN 978-1-101-54513-3. ^ "Profile for Bad Axe, Michigan, MI". ePodunk. Retrieved August 24, 2012. ^ Romig 1986, p. 38. This page was last edited on 9 March 2019, at 02:41 (UTC).